"I have a condition called Synesthesia that some define as a sort of autism or a condition where your brain experiences correspondences between sound, colour, letter or numbers. 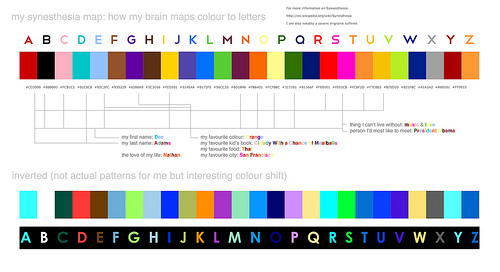 My particular case is one in which my brain maps certain colours to certain numbers and letters. Several famous artists both musical, visual arts, and even literary geniuses have documented cases or even written about their experiences. As a kid I had an incredibly difficult time being made to learn using those magnetic plastic letters and numbers. The colour of the plastic never properly corresponded to the right letter or number so I gave up using them as early learning devices. I included the inversion of the colour map because interestingly enough, blue is a difficult color for me to work with whether in painting or design. It never ever looks quite right to me no matter how it is being used although I consider it a beautiful colour. The inversion has many more tones of blue than my original set."